Star Wars: The Force Awakens: All About Leia & The Ultimate Weapons! This article contains spoilers pertaining to key moments in Star Wars: The Force Awakens. If you do not wish to know any spoilers about the seventh episode in the Star Wars saga, I suggest you hit the back button now. 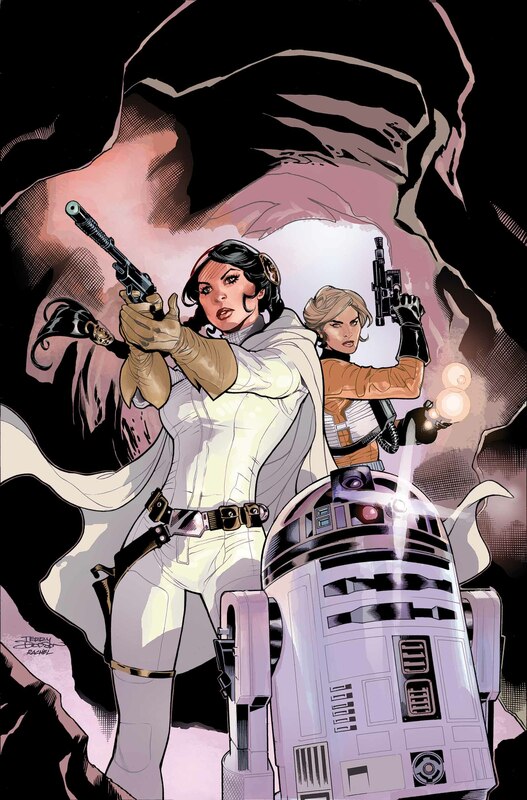 With Marvel’s Star Wars: Princess Leia hitting tomorrow, I’m in a Princess Leia kind of mood. In Star Wars: The Force Awakens, information on Princess Leia has been hard to come by. At first it was looking like she wasn’t going to have a lot to actually do in the film itself. But as time has moved on, she appears to be more structurally relevant to the story than once assumed. I cannot conclusively say she is with Han Solo in this film. I do not believe that to be the case at this point. There are more hints that they have not seen one another in a long time than hints they are about to celebrate their 35th wedding anniversary. Leia sends an emissary to Rose’s planet who is killed by the “Catapult” weapon of the Empire. She is described as a Queen on the main cast list. At one point she tells Rebel pilot Poe Dameron his squadron is all that survived. He reluctantly obeys her orders. She appears to still be a prominent leader of the Rebel Alliance. Leia wants to know what Finn knows (presumably about the Empire). Towards the middle of the film, in the Map Room of the Rebel Base, Leia has a secret “up her sleeve,” involving her own weapon called “The Sledgehammer” by the production. Without storyboards, “The Sledgehammer” is difficult to understand but appears to be a kamikaze-like craft capable of taking down Star Destroyer sized spacecrafts. Leia is proud of this weapon. Rose tells Leia she thinks the sword found inside BB-8 should be with Finn so Leia hands the lightsaber over to him. Leia and Han still argue. When Kylo and Han meet again, it cuts to Leia who feels “a disturbance in the Force” so to speak. There is no indication she is a Jedi or started upon that path with her brother. Leia is elated when it appears Luke has been found. Leia needs to destroy the Catapult in the film and presumably it is The Sledgehammer that will help her do it. The weapons are very abstract in writing. It appears The Sledgehammer is a tough weapon that just crashes through capital starships, maybe even entire fleets. Whereas The Catapult appears to take energy from a ground location (The Evil Castle) and use some orbital device in space to fling the energy/ammo at its target. Destroying The Evil Castle appears to be important as it is the control center of The Catapult but it appears both sections of the weapon need to be destroyed to ensure safety from the Empire. Don’t hold my feet to the fire on that interpretation though. That’s based off rumors and documentation that appears to support said weapons. I’m still hoping clarification on these things comes to me via credible sources soon. However, as I stated, without a visual on the mechanics of these weapons they’re hard to understand in the abstract way they have been presented to me. 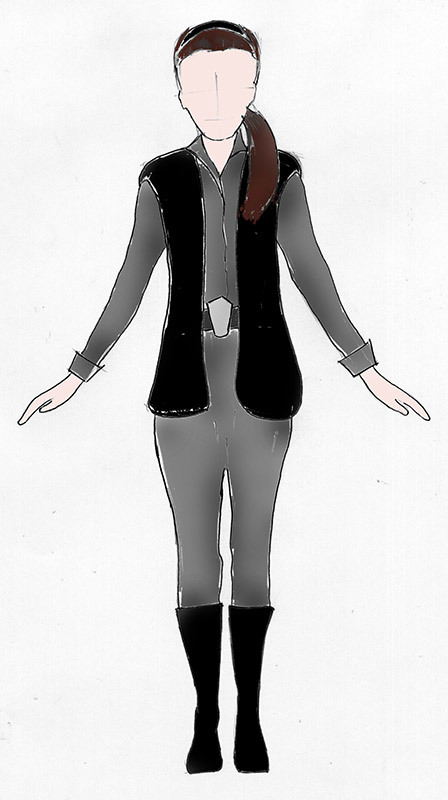 Sketch of Leia’s costume in The Force Awakens. The sequence in which Han leaves Leia for the last time might be very touching. “I’ll hurry back” might be said passionately with longing. However, the delivery might be like he’s going to the store. Since he’s going on a mission that isn’t going to be a picnic, I prefer the first interpretation that its a final goodbye that makes heart’s melt. However, we can’t say firmly how Han Solo delivers the line to Leia just that he does and it is important enough that its noted in the subject of the scene. It can really be read both ways though. The couple appears to still be at odds in the film and that heat has not cooled over time. 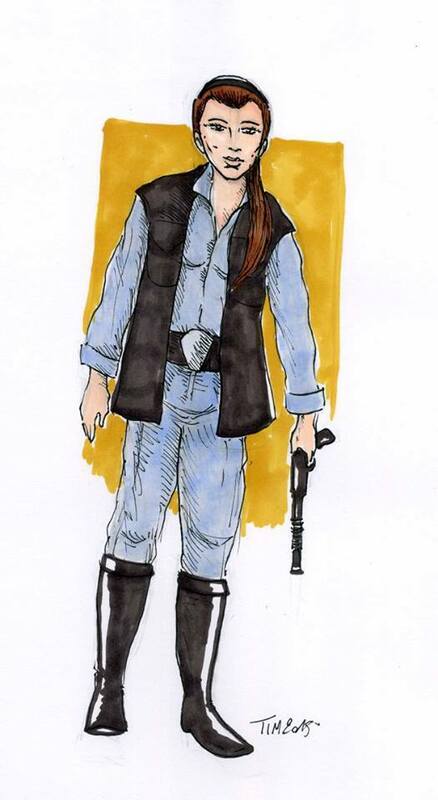 Sketch of Leia’s costume in The Force Awakens by Tim Deceuninck. The fond farewell between Rey and Leia is going to spark another round of speculation that the two are in fact mother and daughter. Was Rey born “Kira,” believed her name to be “Rey” and then finds out her parentage as the film moves on? Its possible but still just theoretical at this stage. If you buy into the idea that Rose’s flashbacks depict Rey and Kylo as children at an academy run by Luke Skywalker that is attacked by “The Seven” and the children are scattered and believed to be dead, it sort of makes sense. After all, with the children feared dead, if Han and Leia were the parents it could drive them apart and Luke into seclusion. But that’s just a theory based off implication. The sequence could basically just be “thanks” but the subject of the sequence seems to imply a strange level of warmth for characters with little personal connection, but that’s just my theory and hope. Leia being proud of a weapon feels strange to me. So its either played like she’s a badass with a powerful comeback she can’t wait to stick to the Empire or she’s started to become the very thing she set out to destroy. If this film even has an once of the “moral ambiguity” George Lucas wanted it to have when he conceptualized the final trilogy, this could be it. If the idea that Rey and Kylo are her children pans out and she believes they were killed by the Empire years ago, the “gloves” might have come off for Leia. But I think being proud of one’s weapons is against the cloth Star Wars is cut from, at least for the heroes. I am interested to see how the Rebels deal with having such power themselves and even more so what Luke Skywalker might say about it in Star Wars: Episode VIII.